Have you ever experienced hair envy for thick and luscious locks? If so, help is at hand, because the future of beautiful hair has arrived! After many years of development, head&shoulders has launched NEW Thick & Strong Extra Thickening Treatment, designed to boost your hair’s appearance. Designed for women with fine hair, the product delivers an immediate boost with lasting strengthening and thickening benefits. Used as part of the Thick & Strong collection, it can double* the look of your hair from the first use! head&shoulders Principal Scientist, Dr Sian Morris, says: “The product treats the scalp and hair fibres so that with regular use, the treatment will leave hair looking thicker and stronger in just two weeks”. Now you can test those claims for yourself by winning one of three fabulous Head & Shoulders hampers, to include the new thickening treatment. This one is island of Ireland only (but if you're reading from elsewhere, check out the worldwide giveaway on my Facebook page!) - just pop your details into the box below for your chance to win! NEW head&shoulders Thick & Strong Extra Thickening Treatment is available in all leading retailers, for only RRP €12.49**. **RRP is at the discretion of each individual retailer. ooh my aunty would love this..
Huh, super curious to see if this works! I used to have the thickest hair in the world, but it's gotten super damaged and way thinner in the last couple of years. I'd love to see if this would restore it to its former glory! This must have been made with my fine hair in mind, I'm always trying to make it look thicker!!! Would love to win this, my thin fine locks are in serious need of some TLC! Oh I really hope this stuff works! I have the thinnest hair ever and I'm always looking for something that actually helps it get a bit thicker! 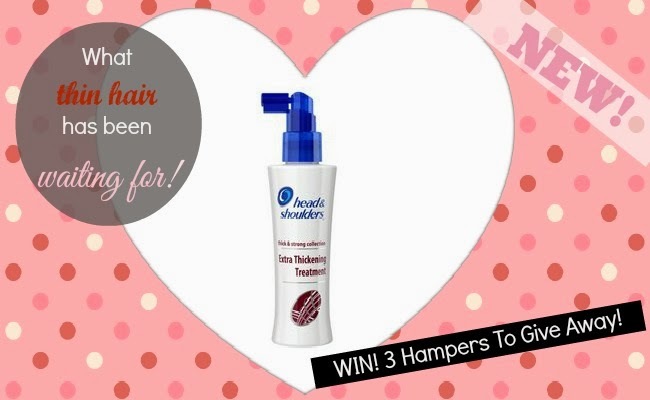 i spend a fortune on dandruff shampoo so i LOVE this giveaway. Just what I need. I've hair so thin can't fill pretty hair accessories. This sounds like something my fine, thin and brittle hair could do with. Oh this looks really interesting! This sounds like it would be a great product! would love to try this , my hair is so lank and thin. This would be interesting to try! I always use head and shoulders 2 in 1. Have never seen this one before. Maybe it hasn't made it's way to Belfast yet!! ooooh I want to try!! And win of course! I'm always interested in trying something to give me thicker hair! I def need this because my hair is super thin ! this product sounds awesome. head & shoulders makes great products. Would love this! My hair is so thin Ive tried everthing! Wow this is a great prize! We always use Head and Shoulders Shampoo but this extra thickening shampoo would be even better for our fine hair. Bring it on.